Today, on 31 May 2018, Frits van der Waa writes a short, yet raving, review on Wiek Hijmans’ new CD Electric Language in the Dutch national newspaper Volkskrant. He praises Hijmans’ meticulous mastery of tone colour and timbre. Van der Waa also mentions the “intriguing” microtonal melodies in article 6 [waves] by Rozalie Hirs. From 17 May until 17 September 2018 The Listening House (Luisterhuis; 2017) by Machiel Spaan (concept, design) and Rozalie Hirs (music) is exhibited at Sound Art Expo, STEIM, Schipluidenlaan 12, 1062 HE Amsterdam, The Netherlands. The exhibition is open every Thursday and Friday from 13:00-17:00 (except on public holidays). On 13 May 2018 at 20:30 CET ASKO|Schönberg and Etienne Siebens (conductor) perform the new double harp concerto parallel world and sea (2017-18) by Rozalie Hirs during the concert series Obsessions at TivoliVredenburg, Utrecht, The Netherlands. The harpists Ernestine Stoop and Godelieve Schrama act as soloists during the performance. The concert is preceded by an interview with Rozalie Hirs about her musical obsessions, as well as a reading of her poems. The new work, composed with support from the Netherlands Performing Arts Fund, is scored for flute, clarinet, French horn, trumpet, 2 harps, 2 percussionists, electronic sounds, violin, viola, cello, and double bass. Earlier on 13 May 2018 at 15:30 CET the cycle parallel world and sea is also performed during the Dutch Harp Festival at Tivoli|Vredenburg. On 13 May 2018 at 15:30 CET ASKO|Schönberg and Etienne Siebens (conductor) present the world premiere of parallel sea [to the lighthouse] (2018) by Rozalie Hirs during the fifth anniversary edition of the Dutch Harp Festival at TivoliVredenburg, Utrecht, The Netherlands. parallel sea [to the lighthouse] (2018), commissioned by ASKO|Schönberg with support of the Dutch Performing Arts Fund, is scored for flute, clarinet, French horn, trumpet, 2 harps, 2 percussionists, electronic sounds, violin, viola, cello, and double bass. During the concert the new work is preceded by Hirs’ recent parallel world [breathing] (2017), commissioned by Royal Concertgebouw Orchestra and the University of Amsterdam. The harpists Ernestine Stoop and Godelieve Schrama act as soloists during both performances. In the evening of 13 May 2018 at 20:30 CET the cycle parallel world and sea is also performed during the concert Obsessions #1 at Tivoli|Vredenburg (Hertz Hall). Just received this fun picture, taken by a friend who is having breakfast in the grass. 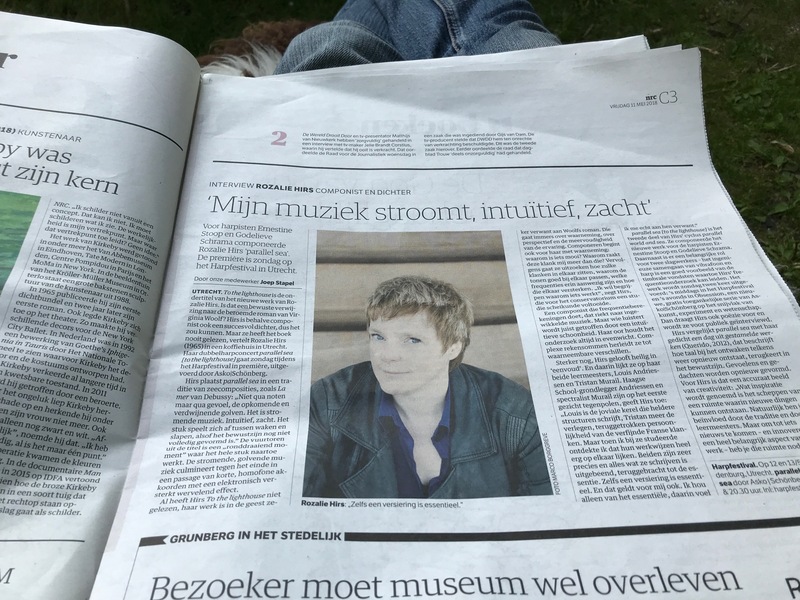 And who came across an interview annex preview by Joep Stapel in the daily Dutch newspaper NRC: “My music flows, intuitively, quietly”. Earlier this week the same article has also appeared online NRC online under the title ‘Inspiration is the space where new things emerge’. Read it here. Or download the [PDF]. “Inspiration is the space where new things emerge” – a wonderful interview by Joep Stapel in the Dutch national newspaper NRC today [Dutch only; English translation to follow]. We talk about my new double harp concerto Parallel world and sea (2017-18) that will receive its premiere performance by ASKO|Schönberg this Sunday 13 May 2018 at 15:30 during the Dutch Harp Festival and at 20:30 during Obession #1. Both events take place at TivoliVredenburg, Utrecht, The Netherlands with financial support of the Dutch Performing Arts Fund. Portrait photograph by Marco Borggreve. Happy reading! Hope to see you on Sunday! The critic Siebe Riedstra just has sent me a to an updated review of my CD Platonic ID (2007), performed by ASKO|Schönberg. This review originally apppeared in the magazine Tijdschrift Luister; it was slightly revised and can now be read online Opus Klassiek. Thank you, Siebe Riedstra!